So, I am totally back from Vietnam, 5 days to be exact! and I have been catching up on all the blog posts so let's get this one started. 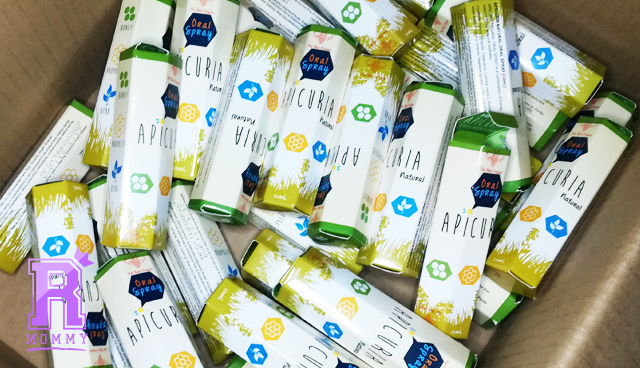 Apicuria sent me a box of their oral spray about a week ago and I just got to open and try the product the day I get home from the airport. 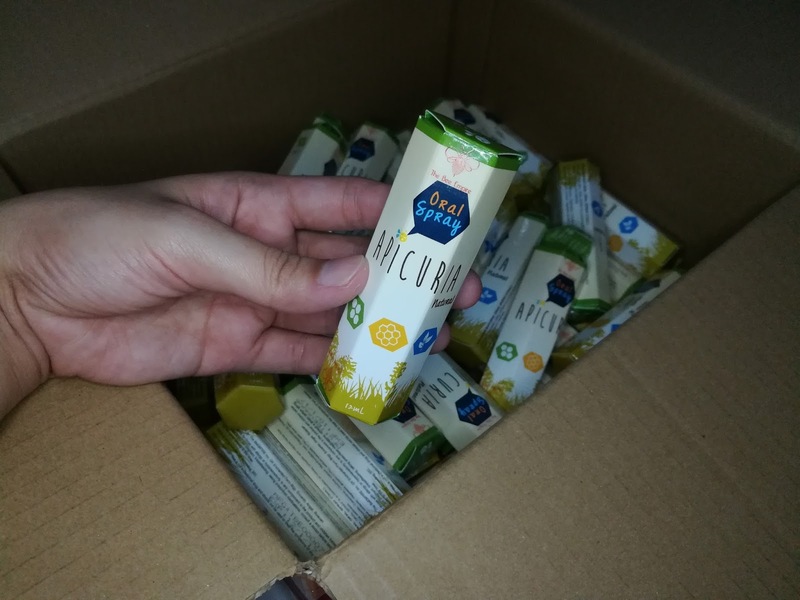 The timing for me to try this product is really good cos I was suffering with an itchy throat and my vice was a bit coarse maybe from the red eye flight, plus I was really really tired from carrying Arya around the airport all night, add that the transition of weather is really bad which could have all contributed to my throat issues. Apicuria Oral Spray is made by social enterprise The Bee Empire which advocates beekeeping as a sustainable livelihood and as an integral part of crop production in the Philippines. Beekeeping can allow income generation through products made by bees such as honey, wax, royal jelly and propolis. By building a community of beekeepers, The Bee Empire aspires to create a commercial value chain that produces a line of high quality bee products. Harlika Pure Honey, Propolis, Licorice extract, Marshmallow Root, Mentha Arvensis Oil, Perilla seed extract, Calamansi (Vitamin C). Spray 2 to 3 pumps on throat, mouth or affected area 3 times a day or as needed, preferably after meals. Best to start at the first signs of sore throat or cough. Not advisable for those with allergy or hypersensitivity to any component in the product and children below 1 year old. If you are pregnant, breastfeeding, taking prescribed medications, consult a doctor before using. Do not spray directly to the nose. After using this for 5 days, 1 spray per day usage. My first initial thought after spraying this on my throat is that is tasted like the Mentos candy + honey. It was really soothing to the throat and gives you that instant relief. However, I am not a fan of anything sweet and so it kinda gives of that sweet taste on my mouth so I do wash it off with water after a few minutes. I do have to say that it did relieved my throat from the irritation I was experiencing so it was definitely a good sign! I started giving out the product to my friends and family but I still got a few bottles left to be given away during the #MomTribe event happening on May 14th, Eastwood Mall together with other mom groups. Click here if you want to know more about the #MomTribe event. Overall, I find this product really interesting since this is the first time that I used such product. I would definitely recommend this to everyone who needs it. It's already a plus that it is stored in a travel sized bottle so you can bring it anywhere with you! 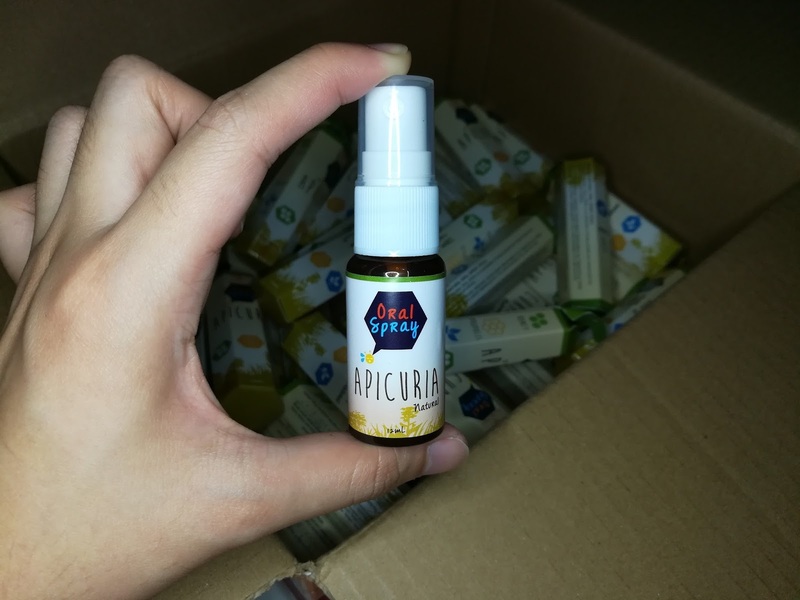 Apicuria Oral Spray is also sold at Human Heart Nature website for P299.00 per 12ml bottle. Click here to find out more.